Matthew Smith, 37, was arrested in Springfield, Kentucky, Monday after police found five loaded weapons in his pickup truck. 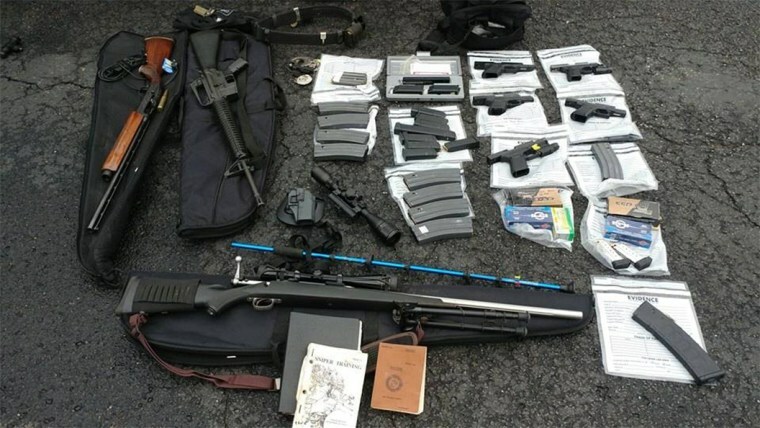 Police in Kentucky believe they thwarted a possible mass shooting after they arrested a man outside a manufacturing company with five loaded guns, including a modified AR-15 rifle. Smith was sitting in his pickup truck when officers arrived and "became uncooperative," Springfield Police Chief Jim Smith told NBC News. One officer saw that Smith was holding a pistol in his hand and ordered him out of the car. The police chief said the suspect pointed the gun at the officer's chest and the officer was able to disarm Smith and get him on the ground. Officers then located a second handgun in Smith's waistband and another at his ankle. An AR-15 was found on the front seat of Smith's truck along with a .380 rifle. The AR-15 had been altered, possibly enabling it to fire as a fully automatic, the police chief said. During his arrest, Smith told officers he was "going to do what he needed to do" and suggested that he had been analyzing and studying the facility. The police chief said Smith knew which entrances to the building were open and which ones were closed. Police also believe Smith may have been to the manufacturing company before, but aren't sure if he has worked there. "Four people stepped up and prevented what we believe was a mass shooting," the police chief said, praising the two employees who called police and the two officers who responded.